Hard disks can be somewhat frustrating because in the end, they are rather complex devices and may be prone to technical failure. That's why regular monitoring and diagnostics of hard drives is essential in predicting potential break down. 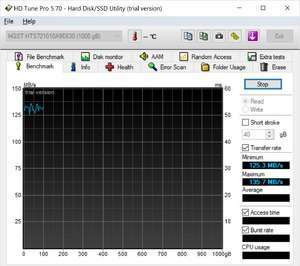 HD Tune is a diagnostic tool which helps check the current status of your hard drive(s) whether they are external USB devices or physically built-in to your desktop or laptop computer. From the main menu of HD Tune, simply select the drive you want to check from the drop-down menu; you will be given immediate access to the current disk temperature which can be visible from the system tray. HD Tune Pro 5.50 is a shareware program and can be used as a demo to try the software until the free trial period has ended. A full version of the program is available after the trial period ends. For security reasons, you should also check out the HD Tune Pro download at LO4D.com which includes virus and malware tests. Additional screenshots of this application download may be available, too.